If you are looking to renew Nepali MRP Passport from Nepal, or any other country from the world, you are in right place. 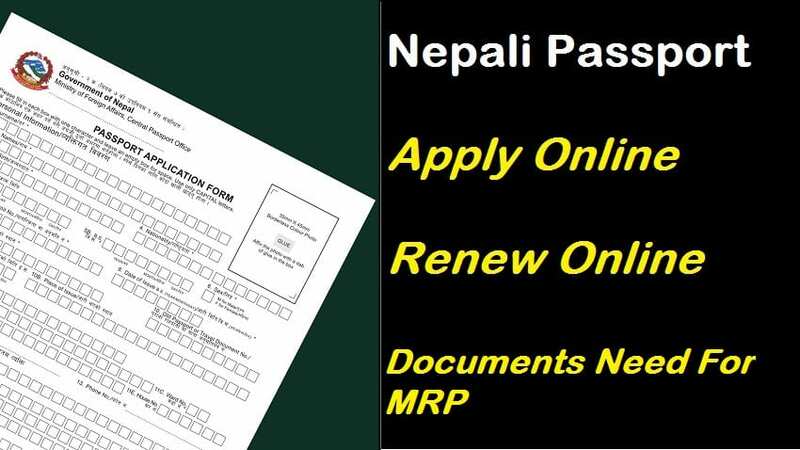 Here you can get all information about how to renew Nepali MRP Passport and what are the documents and what is procedure for renewing the MRP passport. Be with us just for 2 minutes we will let you know all information about how to renew Nepali MRP passport from any part of the world including Nepal. Open the application form using Adobe Acrobat. If you don’t have Adobe Acrobat installed on your PC please download and install it. Once the form is open, fill in your form and print. If you want to know how to fill the application form correctly, find here – Guide to fill MRP application form correctly. Use only A4 size paper to print the form. Paper size: 29.7 cm x 21 cm (A4 size). Printed area size: 27 cm x 18.5 cm (Length and Breadth). These days you can fill the form Online. You can fill MRP renewal form online from here – Fill MRP passport renewal form online. Bring three Copies of Regular Passport Size Photos. Bring your original passport plus two photocopies. Bring Original Citizenship card (Nagarikata) plus two photocopies. Note: Renewal fee depends upon the country where you are located. If you are abroad you have to be in touch with the embassy associated where you are located. Submit a letter requesting for a temporary passport with reasonable cause. Two additional copies of passport size photos.